Out of the patio or next to the pool, our Amish Poly Casual-Back Chaise Lounge is the prefect addition to your outdoor retreat. Featuring a curved seat and back rest, you're sure to find yourself spending more time in your chaise lounge, enjoying those long summer afternoons. Incorporate the Sunbrella cushions for a stylish option and an even more comfortable chair! Don't forget to add our Berlin Gardens Round End Table or Conversation Table for the perfect place to rest your drinks and books when you're enjoying the day! Our Casual-Back Chaise Lounge Chairs are handcrafted, by skilled Amish woodworkers, from an eco-friendly materially known as poly lumber. Poly lumber is made from 100% recycled plastic and will offer you decades of continued use, without the need for refinishing. Available in a wide variety of color options, you're sure to find the perfect chaise lounge chairs to incorporate into any outdoor decor! 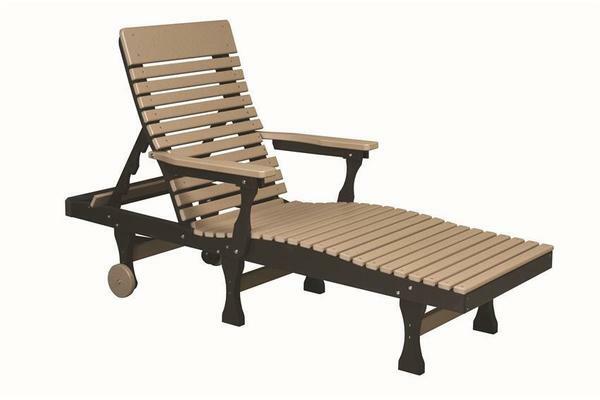 Our Casual-Back Chaise Lounge Chairs are perfect for commercial use! Next to your pool or on the patio, allow your patrons and guests to relax comfortably and enjoy their time. Available in a wide variety of color and cushion options, there is sure to be the perfect chairs to fit into your decor! And, with a five year warranty for commercial use, the Chaise Lounge Chair is sure to be a good investment in your outdoor seating area! Seat Length - 46 1/2"
Height to Arms - 24 1/2"